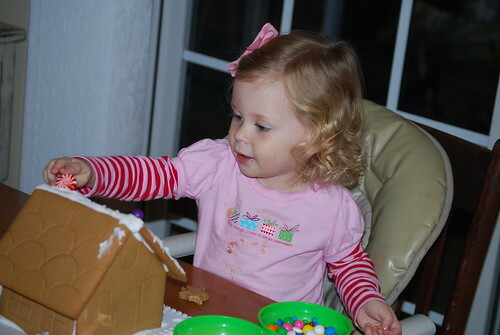 Saturday night Jeff, Landree, and I decorated our first gingerbread house together. Jeff's family has always had a tradition of doing this. 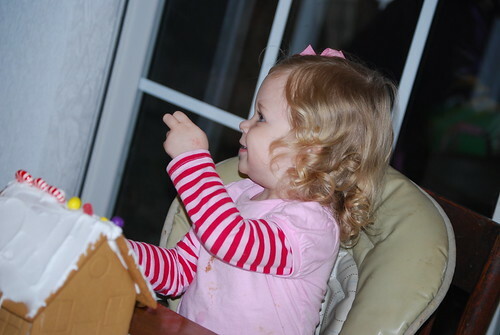 I love traditions and all things Christmas so I was really excited to start doing this with Landree. She loved it! 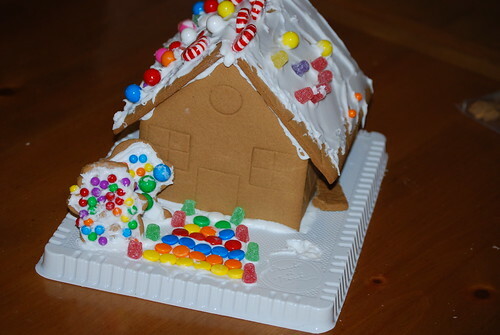 She did manage to wipe her hands on her shirt after placing each piece of candy on the roof. 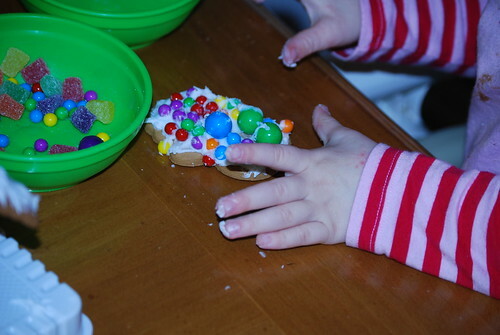 She would dig her candy into the icing to place each piece. 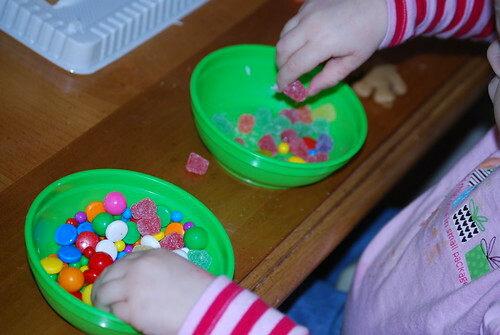 And she loved to transfer the candy from one bowl to another. And our finished product-fabulous! So cute!!! We do this most years too. We have not one it yet though! Super sweet and great pics! My girls do this with my mom each Christmas Eve~LOVE traditions! I have been meaning to come over and visit your blog, we visit a lot of the same "places"
Your little Landree is absolutely adorable...and your blog is beautiful!! 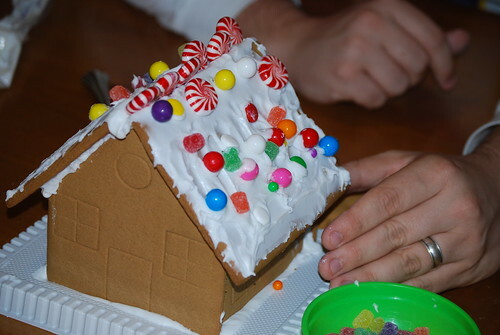 My son Nick builds a gingerbread house each year....this year will be Sarah's first..we have not gotten to it just yet...maybe this weekend!! So cute. I knew you had said that you wanted to do this, but did not know that you had bought it. Landree looked like she had a great time!!!!! We started this tradition too. 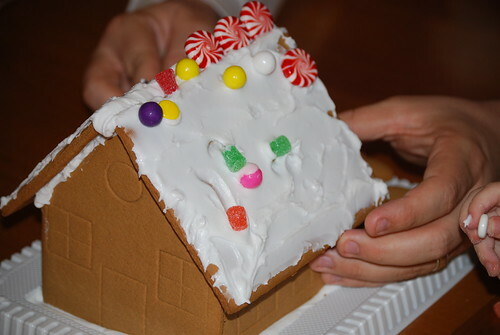 Our local Children’s Museum hosts a gingerbread house workshop every year. It is so fun to go there – everything is nicely displayed and organized and you leave the mess there! We are scheduled to go this Sunday. I can’t wait! How cute! I have to remember next year to buy extra candy. This year I just let the girls use the candy from the kit and they kept wanting to eat it all! We had enough but at the end we were stretching it! I love Landree's shirt! She is just precious. We have our kit and will be decorating our house this weekend while we study for some test and do a book report! Busy time.